Due to computer problems I have been off line for over a week, but those problems have been largely solved. In the meantime explorers have been busy. Here's a report of an expedition in Dennis's home state of Florida. On Dec 15, 2007 divers from the Global Underwater Explorers’ WKPP team completed one of the most celebrated cave dives in the world. 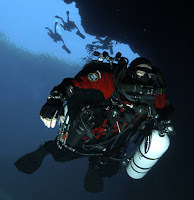 Jarrod Jablonski and Casey Mckinlay completed this dive in order to prove the connection between Wakulla Springs and Leon Sinks cave systems. As a result of the connection the twocaves have become one system formally known as the Wakulla- Leon Sinks Cave system. This cave is the longest cave in the United States and the fourth largest cave in the world. In order to prove the connection the divers traveled a distance of nearly seven miles (36,000 feet). The Scuba dive set two world records including the longest cave dive between two entrances and the longest traverse in a deep cave. The dive required the use of Halcyon rebreathers which allowed the divers to spend nearly seven hours at a depth of 300 feet, followed by approximately 15 hours of decompression.